Can start out at a very high level in Stage 1 but rapidly drops to a low. Recall that in Stage 1, Background Business Issue, there is recognition on the part of a buyer of a particular critical business issue (CBI), but there is little interest or ability to resolve it. A very common reason for this is that the buyer may have taken the time to look for a solution, found one (or more) and concluded it is in the “too much” category: Too much cost or too much time or too much risk. These are the most common buying inhibitors that result in the buyer being negatively disposed to pursuit of a solution to the CBI. When mapped against the Level of Concern for the Solution, this makes a great deal of sense: Early Stage 1 Buying Inhibitors result in a CBI being in the background of a buyer’s mind. But later in Stage 1, the Level of Concern for the Solution rises because management says the problem must be eradicated or the buyer discovers a solution. Coincident with this rise in the level of concern for the solution is a fall for the level of concern for buying inhibitors; the buyer takes the view that buying inhibitors are less daunting because of the desire to solve the CBI. Remains low throughout most of Stage 2. Once again, when mapped against the Level of Concern for the Solution, we see that the buyer’s “gray matter” is focused on the Stage 2 concern for converting the foreground CBI to their envisioning a solution which, in turn, leads the buyer to the concern for someone to prove that they can fulfill the capabilities that make up their view of the solution to the problem. Thus, at this point the buyer’s concern for the value of the solution remains low. Reemerges as a major concern for value in Stage 3. But what happens after the buyer feels they have achieved successful proof of capabilities? The concern for the value of the solution now takes center stage in the mind of the buyer. This is the time when, to align with the buyer, the seller should now work with the buyer to prepare a Return on Investment. This is also the time when the buyer will view the seller as bringing significant value. Firmly but politely tell the buyer that it is too early, you do not know, but as soon as you have the required information needed (i.e., in Stage 3 after proof of capabilities), you will let them know. Assess what you think this buyer can actually spend. Provide a potential low end. You provide the low end so that the buyer doesn’t push the critical business issue to the background (where you have “killed” the deal). Provide a potential high end, slightly higher than what you think the actual cost will be so that you are not later accused of setting false expectations. So the idea behind providing this range is to quote a low cost to prevent the opportunity from quickly going back to a background CBI, wherein you have prevented yourself from helping the buyer, and a high to avoid setting false expectations. Moves into Stage 4 as a major concern for “Best Price”. The buyer’s concern for value in Stage 3 should be viewed by a seller as a logical concern: The buyer needs to see, understand, and agree that the anticipated return meets minimum expectations against the investment. Their logical buy-in is critical, especially because the buyer may have to present and support the numbers to senior management. Therefore, the logical justification must be there. But once that logical justification is there, a substantive change in concern occurs. The buyer transitions from the logical decision of the ROI to an emotional one. If the logic is there, now the buyer want to get the very best deal they can get. Some buyers feel that sales people will always quote high so they have a cushion. Others, of the more-cynical variety, feel that most sales people will do their best to “rip them off”. Still others simply like – or are incented – to negotiate. Regardless of the reason, this is where sales people should anticipate being “squeezed”. If not handled properly by the seller, the impact on the final price, terms, and/or conditions can be devastating. o You helped them value justify the solution. You should now be in a position to resist the squeeze. Sellers have a great deal more negotiating power here than they realize. Drops only to reemerge as a concern in Stage 5. The initial drop-off in concern in Stage 5 results because the buyer’s focus moves to implementation concerns. But, then coincident with the buyer’s desire to achieve implementation success, the buyer’s concern then increases because they want to make sure that they are achieving the performance metrics and financial benefits anticipated. Remains low throughout the buy cycle but rapidly rises in Stage 4 before rapidly dropping off. Let me tell you a story behind this one. I believe that it has great applicability in virtually any sales situation that you might be involved in because it gives you a really good view as to what is happening in the “gray matter” of a buyer. Many years ago, I lived in Chicago. I had a good friend there whose name is John. He and his wife Sue had a baby and decided that they wanted to move to a different part of Chicago. They spent about six months working with a real estate agent, trying to decide on the house they wanted. Now, what do you think the reaction was on the part of the real estate agent who, in their mind, had already spent the commission check? Well, the agent had a very negative reaction to this. In fact, the conversation spiraled downward to the point where John said, “Look, I’m sorry but we aren’t moving forward.” At that the real estate agent shot back, “John, I just spent the last six months of my life working with you guys. You gotta buy this house.” John’s final response was quick. He hung up. About four months after that incident, I had gone back to Chicago to do a couple of workshops done a workshop in Chicago. My work ended on a Friday afternoon and Sue and John invited me to spend the weekend with them, which I did. And I stayed with them in their brand new house! They wound up buying that house. Lets analyze buyer/sell behavior, keeping in mind that they bought the house. I particularly love this example because we have a buying committee with someone above and someone below the power line! It was not until the very end of the buy cycle when Sue and John felt such a high level of risk that they decided to “pull the plug” and not buy the house. 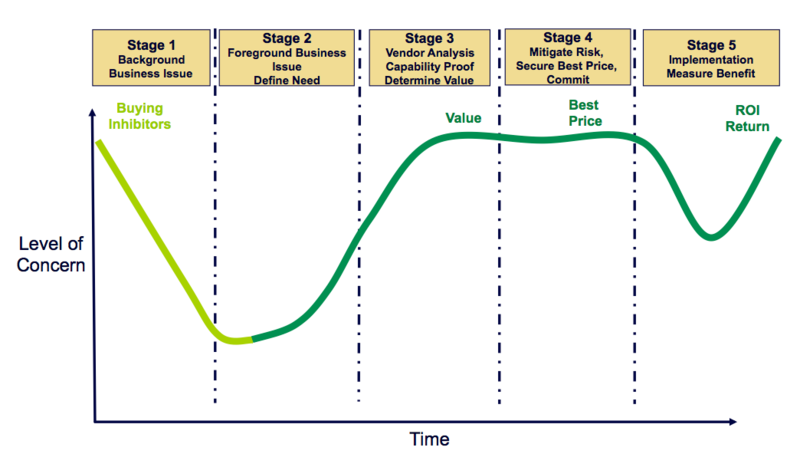 So let’s go back to Stage 2 of the buy cycle, when the CBI became a foreground CBI. What would the conversation have been like around Sue’s and John’s dinner table? “Gee John, I think we need a new house,” said Sue. And what was the rest of that conversation like? “Why?” said John. “This house is too small. The neighborhood is changing. I don’t like the school district,” said Sue. “So, where do you want to move to?” said John. They identified their CBI, identified the reasons for it, and developed a solution. Because it was Stage 2, they had not gone out yet and looked because that is what happens in Stage 3. So it is in Stage 3 where the homebuyers go out and check the market to find their house. So the buyers now go through their Stage 3 and look at numerous homes, analyze them against their requirements, and “narrow the field” to three homes: Options A, B, and C. Most people want to buy home A, but have B and C as backup. So at the end of their analysis in Stage 3, Sue and John hired (and paid for) a housing contractor. The contractor got paid to check the roof, the electrical system, the plumbing, etc., and provided Sue and John with a written report. So which home did Sue and John have the contractor check? A, of course, was checked because that is the home they wanted. That’s the one they “went negative” on and hired the contractor to find potential problems with it. That report was then used in Stage 4, where the Level of Concern for Risk hits its peak, and that was the one that they focused their risk assessment on. That’s the one they were hoping would receive a positive report to mitigate their risk. What does that tell us about the home buying situation, and buyers in general? It means that the home, the vendor, the software, etc. that the buyer wants the most is the one they focus on for risk mitigation! Now let’s go to our selling. What does that mean to you at the end of the buy cycle if a buyer conveys a great deal of risk towards you? It means that they’re serious about you: You are their “column A” in the spreadsheet they use to compare sellers. And what’s the flip side of that? What if a buyer doesn’t convey a great deal risk towards you at the end of the sell cycle? It means that you are likely not their column A. It means that there is a good chance that you’re in column B or C. So risk toward you is a good thing for you to see. It is, in fact a buy signal. How you handle a buyer’s show of risk toward you in Stage 4 can determine whether or not you get the business. If you’re looking for it and you anticipate it, you can again use the logic you have built throughout the buy cycle, but this time to help them overcome their fears. With that concept in mind, “logic overcoming fear”, what should the real estate agent have done with John during that fateful telephone conversation? Instead of the downward spiral, why couldn’t the real estate agent have said in the calmest of calm voices (so s/he didn’t confirm or increase fears), “John, I understand that this is a huge decision. But lets take a look at why we spent the last few months working together.” And now is the time to recall the key logic points that got you to this point. Recall the issue and the causes, recall the capabilities they said they needed, recall how the house they selected fits that vision, recall how they worked out the numbers and the numbers worked well. What they’re looking for is an affirmation of the key items that got them to this point! So risk is a good thing to see at the end of a buy cycle because it means they want you!